As per my usual, everything seems to be coming down to the wire. Truth is I get nervous but I also enjoy this kind of pressure regardless of how frustrating it is. Good news is I now have a trailer which I can use for the show and I've gotten all my fowl I intend on showing into conditioning pens. The entry forms must be in by Sept. 27th, so whoever is in best feather by the 20th will be entered and the others merely sold. that will be staying on the farm after I sell the rest. Pretty much all of those will be sold. Seriously, there is maybe 3 of those birds that will come home from the show. And on top of that there's a ton more birds I'm selling. I'm also working on a bit of cd art for a musician, but will wait until I get the greenlight to reveal who it is and to link to their site on here. As you can guess there's a lot going on lately. This entry will in some ways be my way of itemizing what is going on, what needs to be done, etc, etc. - I have a cd cover to produce - still sketching, but I haven't been given a deadline as of yet. - I need to verify if anyone else is going with me. Somewhere along the line I also need to make crates for hauling to the show, crates for the sales, fix the main chicken house roof, sell the free range chicks....all this needs done before the 8th of October. And I'm moving to Minnesota shortly after the 15th of October. First off, its been way to long since I've made the effort to blog. Simply horrendous of me I must admit. So what's going on? Well, first off I'd like to make the mention that there is the possibility I will be moving my blog to a new address. Once/if I get the new one set up and to my liking I will post a link to it on this one. Don't forget, the holidays are soon approaching and I am taking on commissions once again. New work will be posted very soon. Once Again I've taken forever to getting around to updating the blog. The good news is however that I've finally finished the farm logo. I've emailed the client but have not yet heard back from them (if you're reading this please email me back!). It took a lot longer than anticipated, mostly due to life getting in the way but also the occassional lack of supplies. Time for an update on the painting I posted last time. Its coming along quite nicely and most of the animals are now in the painting. I still have to put 1 chicken in but have to wait until the animals behind it are complete. I'm quite happy with how the donkey is coming along especially. Sunday I will be making a trip to an auction and will be picking up more Titanium white paint so that I can complete the horse and donkey and move forward. I had a "backup" tube of paint but it turns out it was too old and was more like clay, so rather than compromise the painting I am waiting to buy paint on my way through to the auction. You may have noticed a bit of a disappearing act concerning my website. Fear not, it will return! What happened is that I missed the deadline to renew my server subscription and opted to wait to renew until their next billing period. After that I had to reboot my website....well their site wasn't functioning that day so I let it be and decided to try again another day. By the time I remembered they had deleted all of my backup files off their servers even though I had renewed my subscription. So what does this all mean? Simply that I will be getting the website uploaded as soon as I find the disks I kept all my files on. Time to get back to painting, so I will leave you with some new pics of a few of the birds here on the farm. Oh! one last thing. Be sure to check back for updates as soon (very soon) I will be posting an article about a new shop here in town. Its something I think artists, crafters, diy-ers, and farmers will all enjoy. 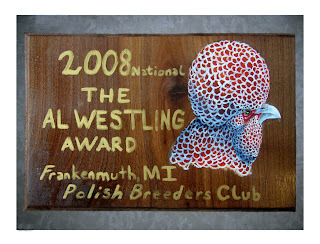 I've been waiting until I had the proper shipping info to unveil these, they are the awards that were given out to the members of the Polish Breeders Club at our National show this year. It was a lot of work (especially finding a way to make the lettering work!) but overall I'm satisfied with them. And don't forget the holidays are fast approaching. If ya have a chicken fanatic on your list and don't know what to get them, have a look at my online store, you may find just what you're looking for. I currently reside in Minnesota where I work two jobs.